The Golden Dames Project - Page 3: Action! Kidnapping! Today you can buy a comic and quickly know who wrote it, who did pencils, inks, colors, lettering, editing, and quite a few other duties besides. Comic publishers weren't quite so diligent about giving credit where credit was due back in the golden age, however. Fifty-five Betty Bates stories were published between 1940 to 1950. Some of those stories aren't credited to anyone at all but those that are credited only to Stanley Charlot. Initially Stanley Charlot was the pen name of Bob Powell but we know for sure Mr. Powell didn't work on every story. In fact it isn't very likely he created the Betty Bates stories he did create by himself. There's enough evidence out there that I'm crediting the art in this Betty Bates story to Nick Cardy. Born in 1920 as Nicholas Viscardi, Nick Cardy entered the comic field working for Will Eisner's studio. Eisner's studio was a comic book "packager". Many publishers were interested in producing comic books but didn't want to invest in an art team for a venture that might fail. Eisner's studio created full comics, ready to print, for those publishers - which included the Quality Group, publisher of Hit Comics. 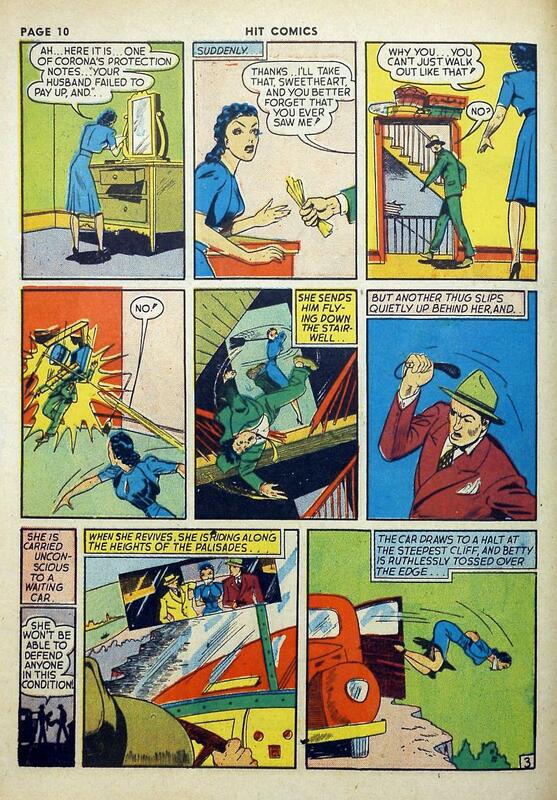 Cardy created the character Lady Luck which ran as a backup feature to Eisner's famous the Spirit. Like many comic artists of the time, Cardy joined the military to fight in World War II. In the army, Cardy worked as both an illustrator and a tank driver. He earned two purple hearts during his time in the army. Nick Cardy is most famous for his work for DC comics during the 50s, 60s, and 70s. He drew 39 full issues of Aquaman and did covers for the remaining 17 issues. Cardy also penciled (and often inked) all 43 issues of the first volume of Teen Titans. That means Nick Cardy was responsible for defining the visual look of DCU characters Mera of Atlantis, Donna Troy, Bumblebee, and Lilith Clay. Nick Cardy was inducted into the Will Eisner Comic Book Hall of Fame in 2005. He died of heart failure in November of 2013. Betty Bates doesn't let criminals run off with evidence! She throws them the hell down the stairs! This is why I love her. Today's page ends on a cliff hanger (pretty much literally!). How will Betty Bates get out of this one? Join us Monday to find out! I'll be talking about it in detail on Monday but most comics were anthology books back in the 40s. They only had 6 pages to tell this Betty Bates tales. Really, Betty was lucky. Sandra of the Secret Service over at More Fun comics rarely had more than three pages per issue to herself. Yeah, I've read some of those old comic books. My cousins had an old dresser just full of them. I don't remember them well, but I do remember each issue having five or six different tales in it, so those little stories moved pretty fast. I wish I had that dresser full of comics now. The moral of this story is pay your protection bill, damnit!